Fungie, a wild Dolphin, arrived in Dingle Co. Kerry in 1983 and made Dingle Harbour his home. Nobody knows why the bottlenose Dolphin decided to stay as Fungie has never been fed or induced in any way to stay and has no mate or family. Over the years, other bottlenose Dolphins have come and gone but none have stayed with Fungie. Whilst it is not known exactly how old Fungie is, It is estimated that he arrived in Dingle when he was about 10 years old and is about 13ft long. Fungie is renowned for his playfulness around the boat trippers that go out to see him, whether its racing alongside the boats or coming up out of the water unexpectedly close to say hello or to even squirt water at the viewers. It doesn’t make a difference what time of day it is but, unless Fungie is feeding, there is a very good chance that he will come to perform for the visitors on the frequent boat trips. Dingle Dolphin Boat Tours has a fleet of 8 fully licensed boats that are run by experienced crews who know where to find Fungie and how to encourage him to play – but not by feeding .The boat trips are run daily ( weather permitting) throughout the year and at regular intervals . It is advisable to ring ahead or the day before to schedule your trip. Boat Trips: One hour trips to see Fungie are daily ( weather permitting) and year round and booking in advance is advisable. If you would like to book your Boat Trip you can email [email protected] or call on +353(0)669152626. The best spots on the boat is usually the back corner seats so if you can arrive a little before your booked time and get in to the queue early you should be able to get the best seats ! 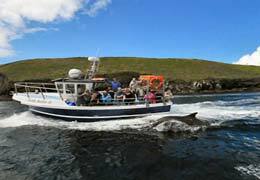 Dingle Dolphin Boat Trips invite you and your school group or barty group to join them on a memorable 1 hour tour to see Dingles most famous resident Fungie the Dolphin in the scenic Dingle Bay. The Tour provides you with the opportunity to take in the breathtaking scenery Dingle harbour and bay offers in abundance. As there are endless opportunities on this tour for you to take fantastic photographs – a camera is a must. The ferries have the capacity for large groups of up to 60 persons for different functions including private hire, school tours and birthdays or any special occasion. Dingle Dolphin offices are located at the pier in Dingle, adjacent to the tourist office. See Google map at top of this page.